The First Men To Have The Whole World In Their Sights Christopher Potter's new history of space flight, The Earth Gazers, charts the road to the first photographs of Earth — and how it changes an astronaut to glimpse the entire planet at once. 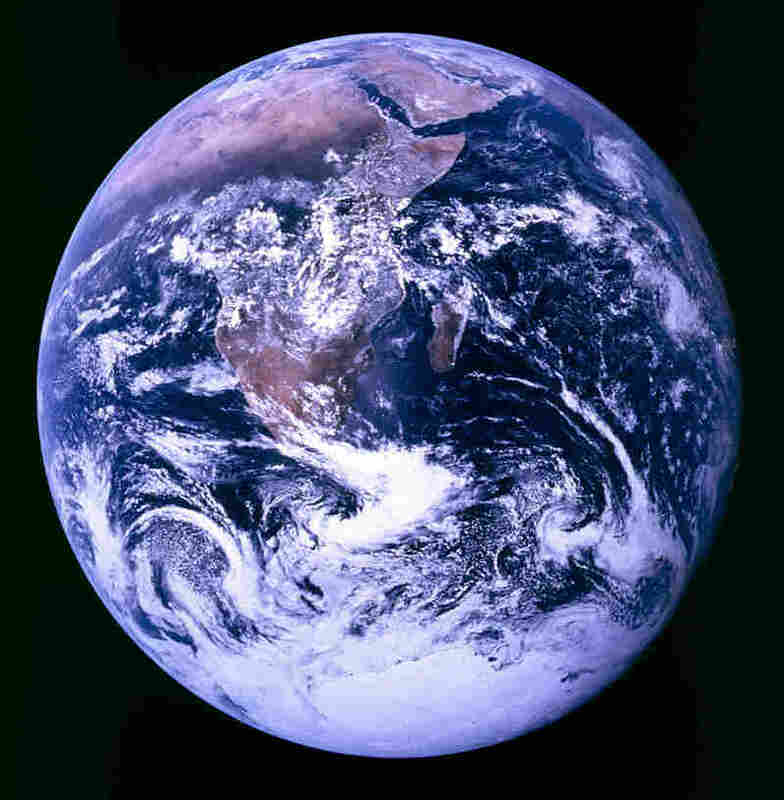 In one of the most reproduced images of all time, the crew of Apollo 17 captured the perspective of Earth known as "Blue Marble." "There was actually a physical moment in time when we answered a puzzle — something that's puzzled us throughout the whole of human history: What did the Earth look like from the outside?" says science historian Christopher Potter. 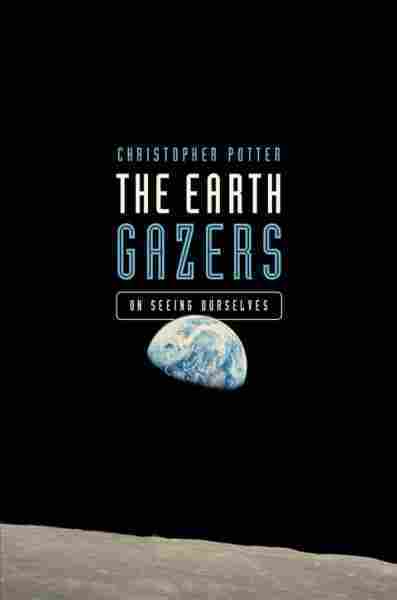 In his new book The Earth Gazers: On Seeing Ourselves, Potter chronicles the people who experienced the view, and how it changed them. One of them is Major General Mike Collins, who has been to space twice. He was the command module pilot for Apollo 11, operating the spacecraft in orbit while fellow astronauts Neil Armstrong and Buzz Aldrin made the first steps on the moon. I spoke with both men. Collins: It projected to me, at least, a feeling of fragility. And that was a surprise to me. I didn't — you know, trodding on the Earth's surface for 39 years — I didn't think it was very fragile. But from 200,000 miles away: quite fragile. And that was my first impression. And my second was the fact that it was inhabited. ... It was certainly absolutely no visual certainty, but I sensed, like little black specks — not people, or maybe it was just some aberration, you know, there were little floaters in my eye, I know not what — but anyway, I was conscious of some presence there. And it was not a human presence. I wondered: Who are all those things? What are those little things — those little black things that are scurrying around? How many of them are there? Where are they going? What are they about? Are they happy? And then I thought, oh yeah, I see it now! A flock of geese went right by, and gee, I can see wolves at the timberline. Of course, none of these things were absolute reality. But they were on my mind. Potter: I'm kind of interested Mike, when you say that you were changed but you didn't know if you were changed for any significant amount of time. Because Charles Lindbergh, when he first saw the Earth from above, you know, to a much lower altitude ... he was the first to fly across the Atlantic [Ocean], aged only 25 in 1927. And he thought — you know, he was very keen on technology in those days — and thought that if we could all have that experience of seeing the earth from even that height, we would all be fundamentally changed as a species. 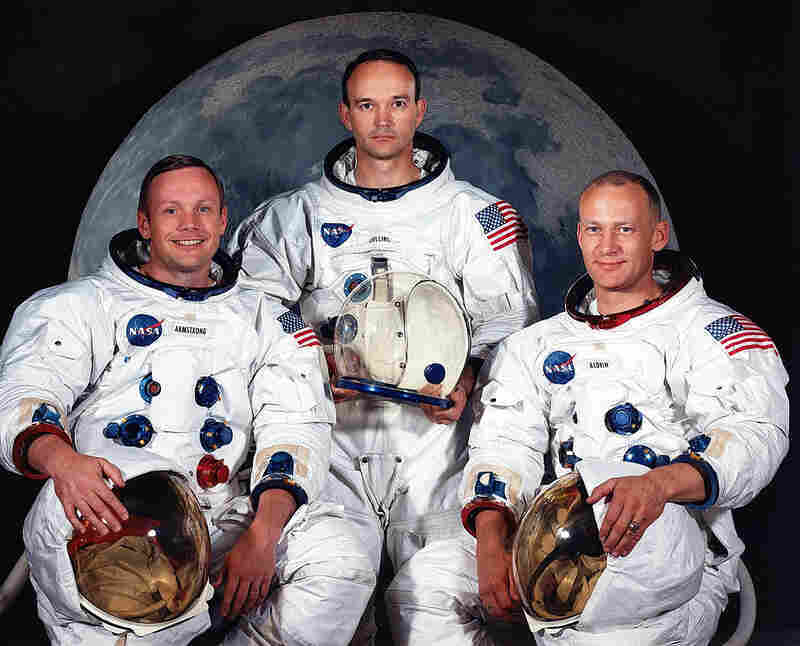 Mike Collins (center) was the command module pilot on the Apollo 11 mission which set Neil Armstrong (left) and Buzz Aldrin (right) on the moon. Collins: No, I think you take into space your religious notions and return with them pretty much unchanged. Potter: When Apollo 8 was being reported, some of the papers have suggested that here was an opportunity — you know, an extraordinary experience was had out there in space that we don't really have the language [for]. I'm trying to search for the words — I don't really want to use the word "spiritual," so "numinous" is the best I can come up with. And I think in some of the ways that Mike has been talking about that experience, one could say, sort of, "religious." But gee, we're just getting started. Wait'll we start sending people back to the moon — maybe you will get a philosopher, a priest and a poet. Onto Mars — that's going to be even more extraordinary. And perhaps the reactions of people who see the Earth not as something the size of your thumbnail, but something you can't even find — it looks like a bright star out there — then maybe you will get a different reaction, and answers to some of the things you're looking for. Denise Guerra and Martha Ann Overland produced and edited the audio of this interview. Patrick Jarenwattananon adapted it for the Web.